A while ago I wrote a blog entry on the abandoned boats I see on my bicycle travels across Detroit. They seemed to be discarded everywhere I rode. 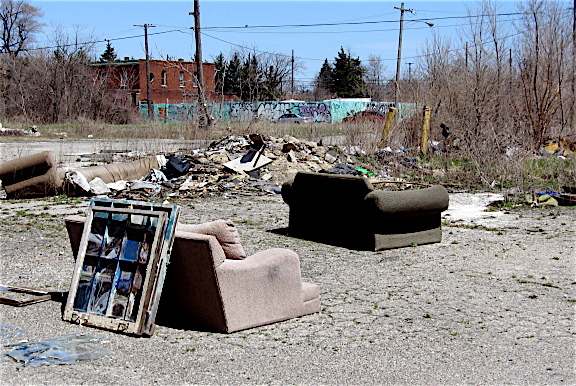 I’ve seen them in large overgrown fields, in abandoned factories, along eastside streets close to the Detroit River, and within small, fenced-off neglected city parks. Although I still see them on my rides, fortunately, I see fewer of them than I once had. 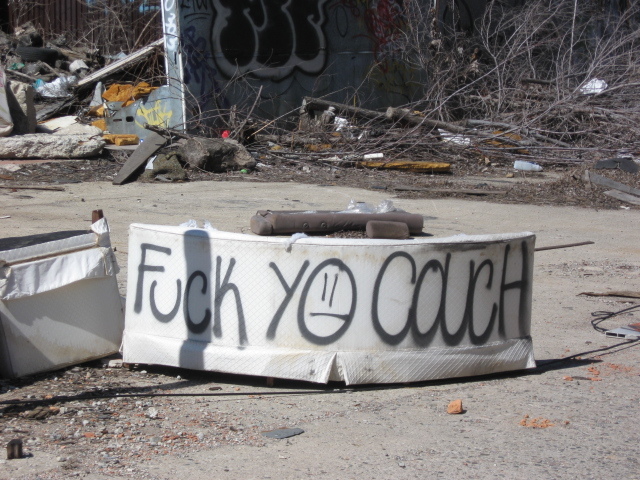 Unfortunately, trashed couches have replaced the cast off boats. 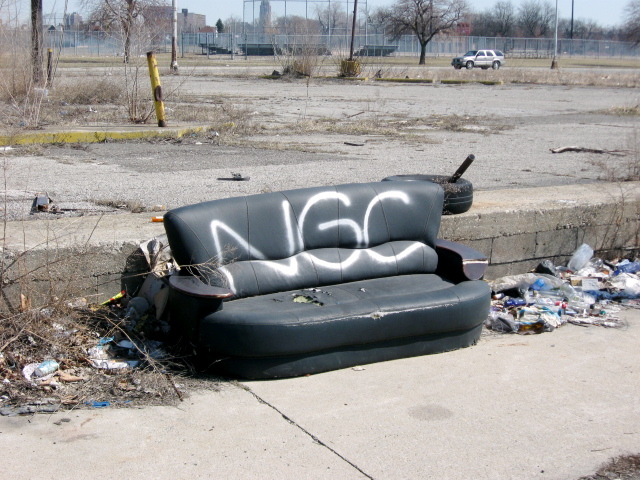 Like the boats I saw in the past, the couches can be found just about everywhere I ride in this city: along neighborhood streets, in secluded parking lots, abandoned garages, and like the boats, stuffed into vacant factories. 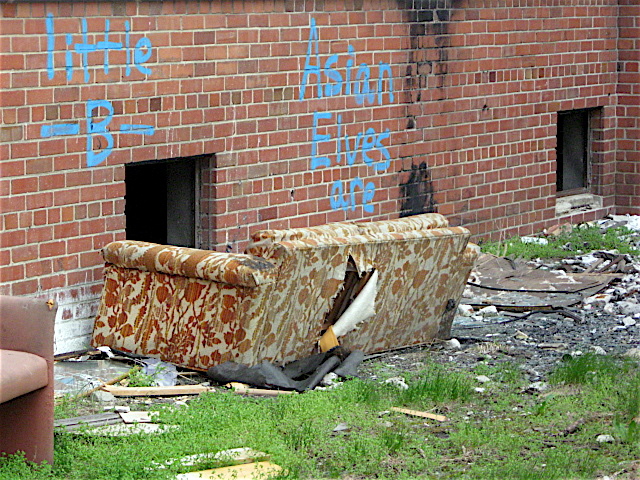 It seems the couches are more widespread than the abandoned boats. I would assume that’s the case because they are smaller and easier to dump from the trunk of a car or from a small pick-up truck, unlike the watercraft, which usually requires a trailer to transport. Many of the couches look to be in relatively good shape, perfect for those looking for an accent piece for their living room. They come in a variety of styles, colors, and fabric finishes, including leather. 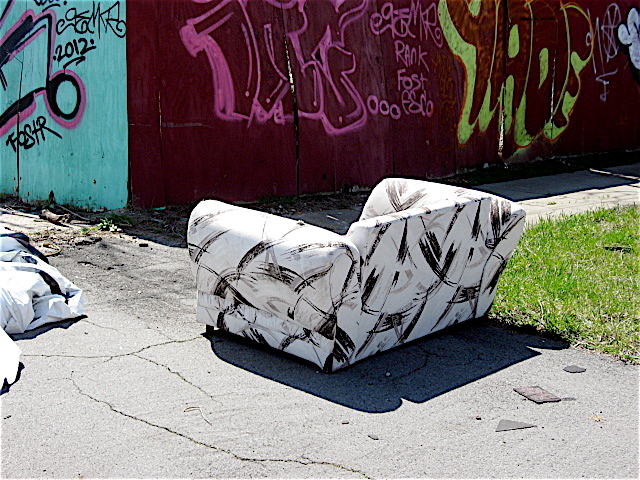 Some have matching love seats and in some cases they come with custom graffiti messages! 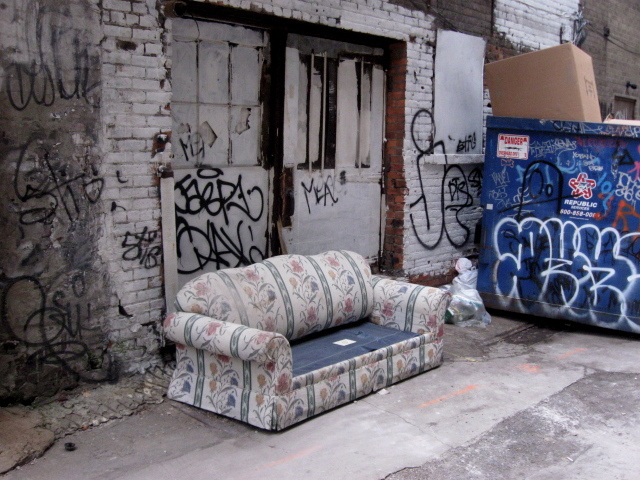 Perfect for folks interested in a true urban look for their home. If you’re lucky, you may spot someone illegally unloading one of the overstuffed beauties in a field or parking lot. 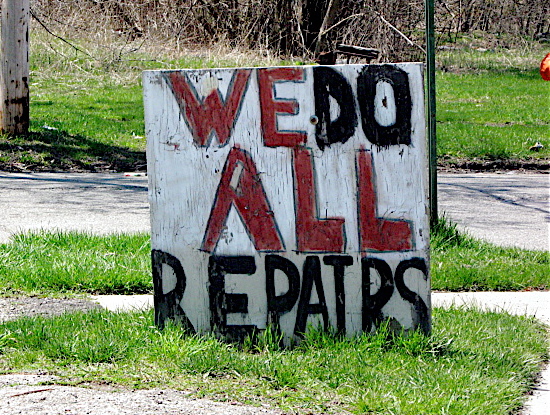 If asked nicely, they may deliver the couch they are about to dump directly to your home. Of course they might impose a small delivery charge. Their fee will help defray the huge fine they will be paying when they get caught trashing the city, which I hope will happen soon. 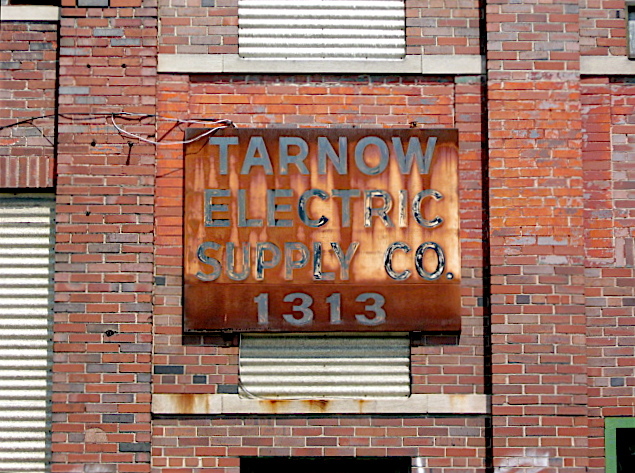 John Kronk Street is an industrial lined street in southwest Detroit. It runs about two miles, from Livernois Avenue on the east to the Dearborn city limits on the west. 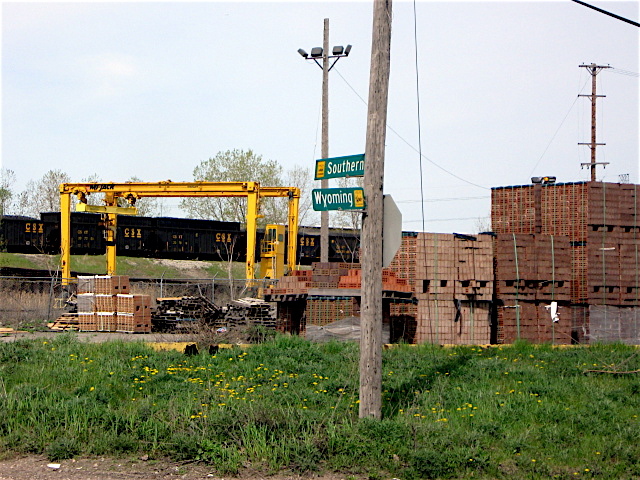 It’s a wide street that bumps up to some of the largest railroad yards in the city. The massive yards seem to be a major hub for freight trains with at least ten sets of tracks spread across acres of dark soil. 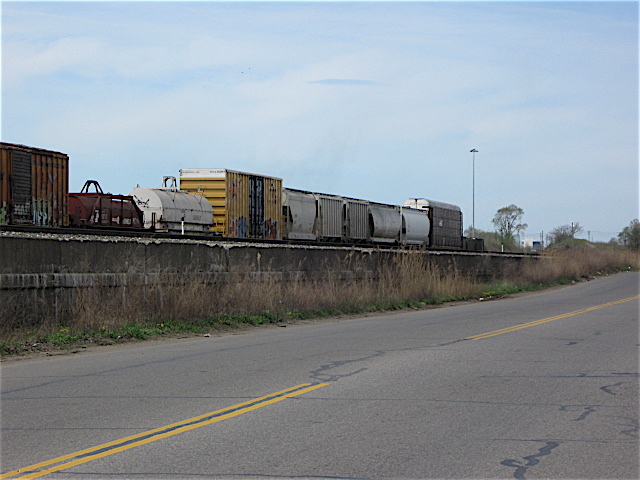 Beyond the tracks, looking south toward the Detroit River, are piles of what appears to be gravel or coal stacked a few stories tall like large ant hills found in a field. 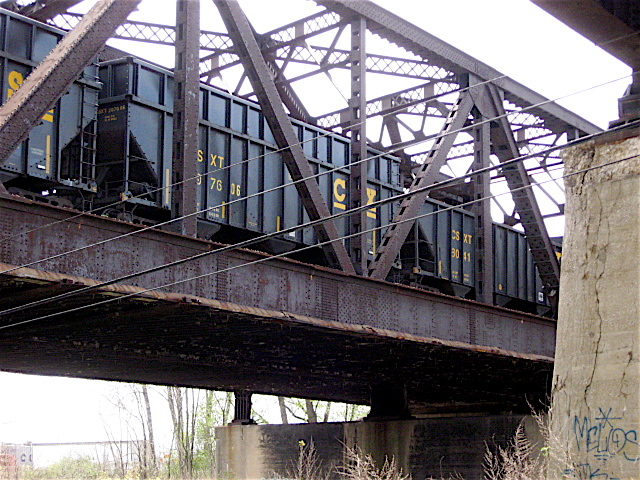 Toward the western end of the street are a series of black overhead train tracks that cross Kronk. They rest on thick steel trestles that are supported by brawny cement pillars. 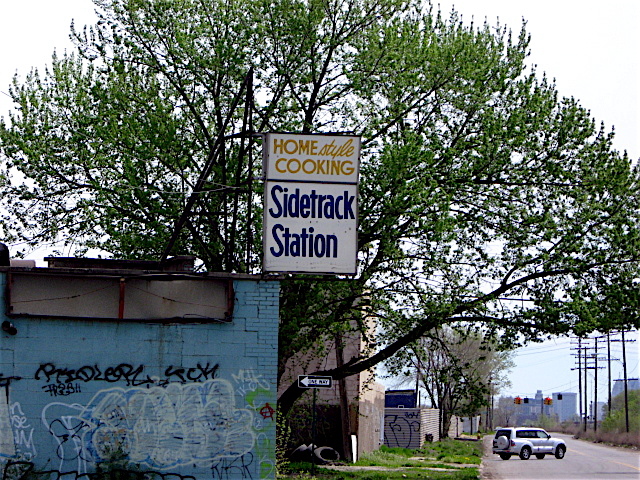 The tracks feed directly into the railroad yard and the heavy industrial complexes found near that end of the street. Approaching the west end of Kronk (near the Dearborn border) on my recent bicycle ride, I noticed a very cool 1920’s vintage RR building on the north side of the street. 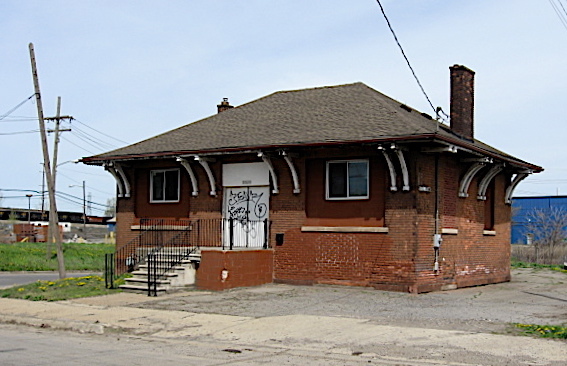 At one time it could have been a small passenger station or ticket office for trains heading out of Detroit. Despite a little graffiti, it looks to be in remarkably good shape and well maintained. Also on the north side of Kronk are a series of truck terminals, used auto parts sellers and numerous junk yards. The large truck terminals I passed had hundreds of semi-truck trailers backed into loading docks and lined up along a chain linked fence that faced Kronk. The trailers were packed in like cereal boxes on a supermarket shelf, with little space between them. There are also large manufacturing facilities on that side of the street that include a ferrous metal processing plant, a brick manufacturer and other miscellaneous small manufacturing facilities. Noticeably absent were party stores, restaurants, and other small businesses of this type. 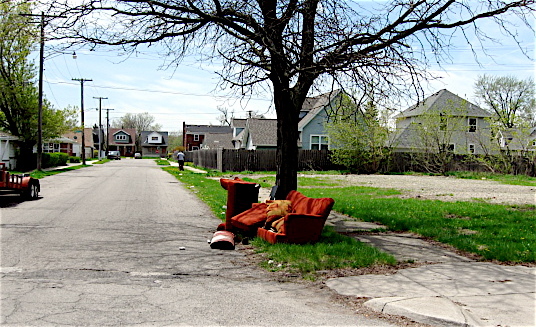 Like many streets and neighborhoods in Detroit where I’ve ridden my bicycle, Kronk is a street of contrast. At the east end, off in the distance, are the gleaming towers of the Renaissance Center and other tall buildings of Downtown Detroit. At the other end, to the west, are the dark, coal colored steel plants of Zug Island and the Ford Rouge plant. 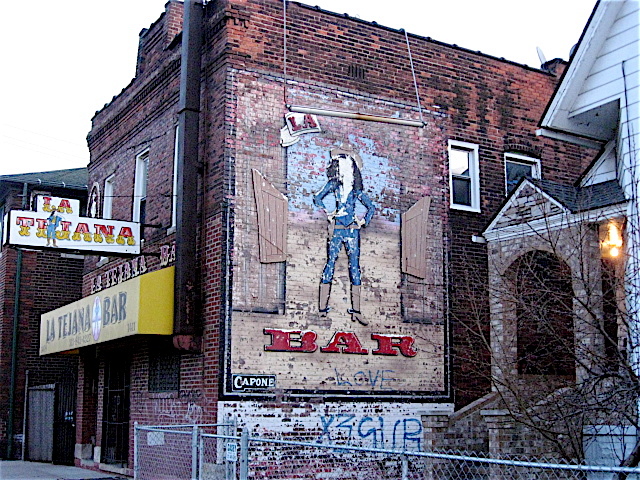 Back in May of 2010, I wrote the first of a few blog entries on the amusing signs of Detroit I see on my bicycle rides. 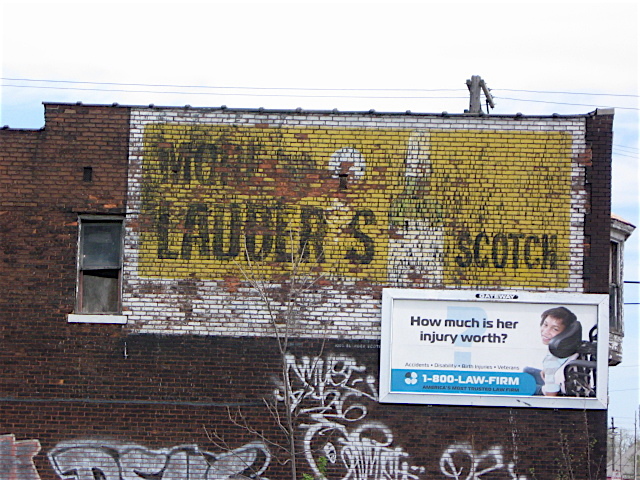 Many of the advertising beauties that I’ve seen over the years are hand-painted, some with drippy letters, making them difficult to read. 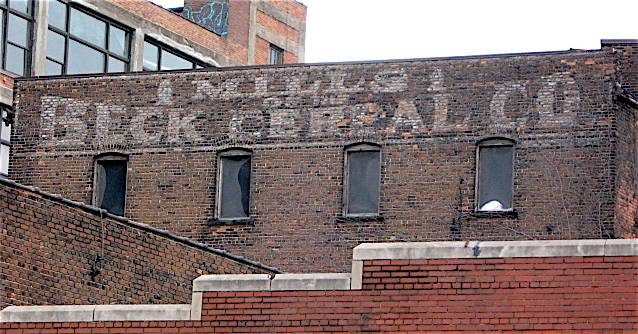 Others are professionally painted on the sides of building and are full of misspelled words. Several others, such as those nailed to trees or utility phones, spell out things that are impossible to decipher. Others are eye-catching in their bold use of color and feature crude drawings of food items, car parts, etc. One in particular that I featured in that early entry was quite humorous in its spelling. 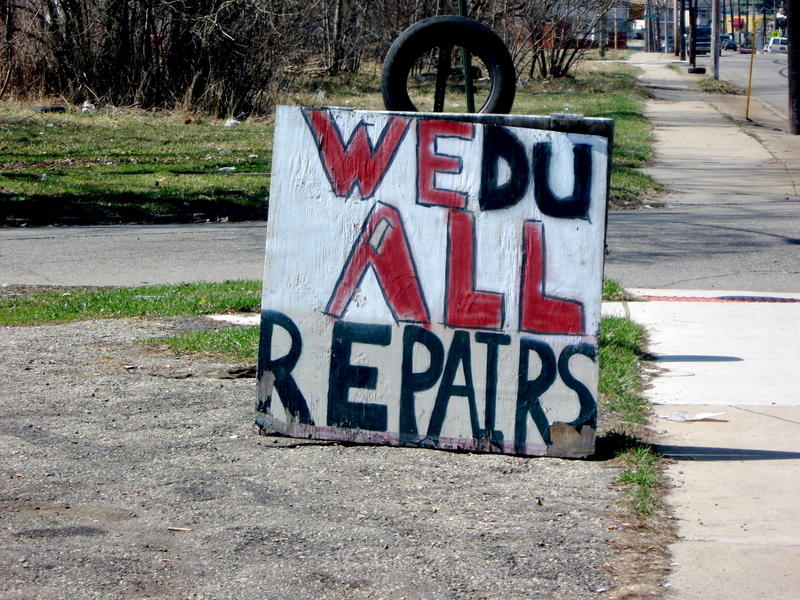 After a couple of years riding past this beauty, I noticed a few days ago that the spelling had been corrected. In some ways, I was sorry to see the change. 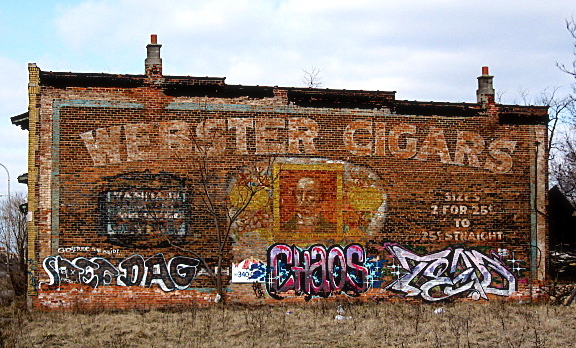 The other day I spotted an old gray shack while on a bike ride through Detroit’s eastside. The small, weather-beaten scarred building was tucked into a corner of a fenced-in lot full of weeds, overgrown bushes and clingy vines. At first glance, I thought it was an old fishing shanty stored for the warmer months ahead or a kid’s outdoor playhouse that had fallen into disrepair and dumped there. 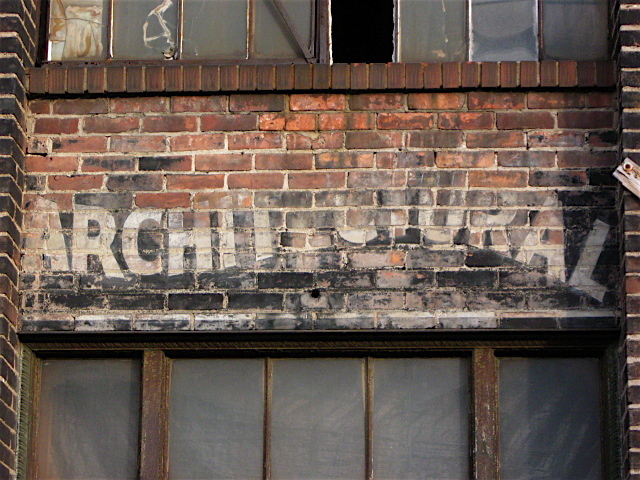 Based on the words printed on the outside wall of the old windswept building on Freud Street, it was probably once a parking lot security guard shelter. Now it is nothing but a rickety old place that is barely standing. The door and windows of the wooden building are long gone, and the backside wall is almost non-existent and consists of nothing more than a gaping hole with a few rotting boards still in place. The slanted roof on this little shack is mostly caved in, and what’s left of the wooded floor has nearly disappeared through rot and decay. 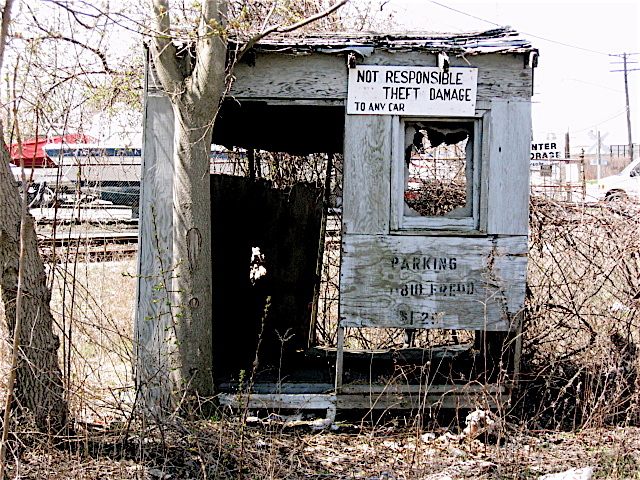 It’s quite obvious this little old one-man sized wooden building has seen better days. I’ve ridden past the old shack just off Freud (a street lined with industrial warehouses, truck depots, boat repair facilities, and automobile impound yards) many times on my summer rides and had never noticed it. The vines clinging to the fence surrounding the lot and the large, wild plants close to the building have always been full of leaves, camouflaging the place by turning it into a big green mass. Without the hindrance of full-bloomed leaves obstructing my view, it was easy to spot the little shack from the street. Shortly, the leaves will pop out for the summer and the wooden shack will once again become invisible. 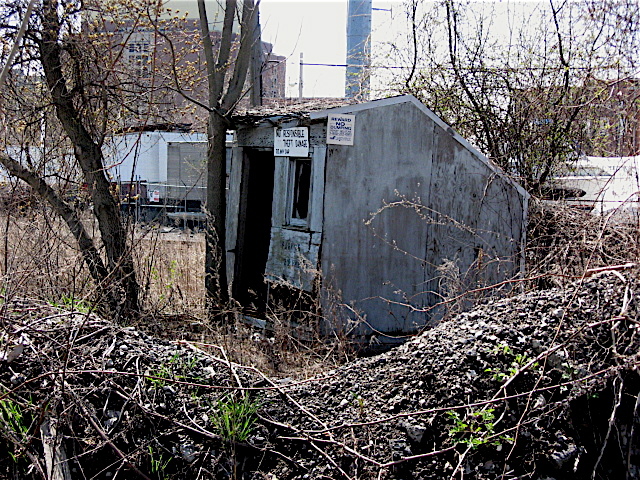 I’m not sure what business may have been on the large lot where the old wooden security shack rests, but the time-worn gray shack seems to have outlived the business it served.